Licensed From – Minos-EMI S.A. Copyright (c) – Ph. 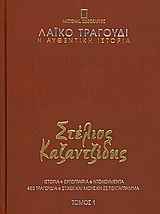 Nakas S.A.
First volume of "A΄ Μουσική Συλλογή" (volumes 1-8), dedicated to Στέλιος Καζαντζίδης. It consists of a leather-bound book, 3 CDs (in card sleeves, numbered #1, #2, #3), and a deluxe case to house all 24 CDs of "A΄ Μουσική Συλλογή". The musical notation sheets are Copyright Φ.Νάκας ΑΕ or Copyright ARCO. Enhanced content consists of PDF files with musical notation for tracks 1-1, 1-3, 1-8, 1-13, 2-1, 2-5, 2-15, 3-1, 3-3, 3-17. Writing credits are listed in genitive.